eviivo is a booking & channel management system that offers small hospitality and tourism businesses a single and centralized platform from which to manage their property website, bookings and payments. Incorporating a color-coded diary, full PCI compliance and built-in integration with Expedia, TripAdvisor and Booking.com, eviivo aims to deliver a user-friendly property and booking management solution. Designed to simplify property management, eviivo provides users with a color-coded diary that enables users to review all online booking activity at a glance. 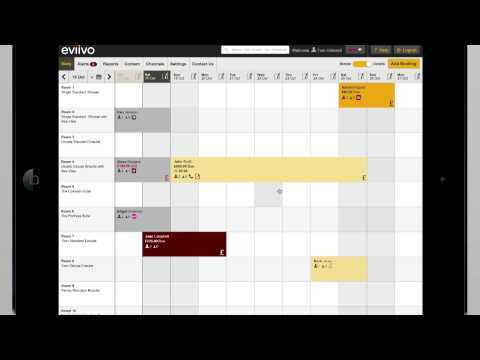 Further to booking management, eviivo’s diary functionality allows users to manage the day-to-day necessities involved in running a small hotel or B&B. eviivo’s diary, therefore, permits users to check room availability as well as review outstanding payments and any scheduled room maintenance. Since eviivo is available as a native mobile app on iOS and Android, users can access their business information and diary entries on the move. In order to encourage property reservations, eviivo equips users with the tools to create mobile responsive websites complete with online booking engine. eviivo also permits users to translate their website into multiple languages, thereby allowing users to profit from overseas visitors. By supporting integration with leading travel websites such as Laterooms and Travel Republic, eviivo serves to promote property visibility. Besides channel management, eviivo allows users to manage booking payments and property policies securely with full PCI compliance and features like instant deals and promo codes. With eviivo’s policy management technology, users can manage rates, promotions and discounts easily. There are some useful software features to optimize OTA listings. Being able to manage multiple properties from one account is helpful. Eviivo has been very harmful to our business since our Go Live date on 1/28/19. We expected that the Go Live process wouldn't be perfect, but their complete lack of customer support and communication concerning very urgent issues is unacceptable. Our properties are actively losing revenue every day this continues. Our customer service is suffering. We are unable to complete accounting reports and prepare monthly tax liabilities. For a company whose self-proclaimed mission is "to champion the independent sector and help small hotels, B&Bs, and accommodation providers succeed online", it is unsettling that our repeated requests for technical support have gone ignored. By limiting their clients' ability to govern their own account settings, Eviivo has made itself essential in this process. Not responding to support requests or even acknowledging them is simply unacceptable. The magnitude of the switchover from ReZovation is irrelevant; Eviivo imposed this deadline on its customers, not the other way around. The setup process was focused on making sure our properties were optimized for OTA searches rather than ensuring that our understanding of the process was clear. Most of the initial calls were a checklist to make sure we had pictures uploaded and amenities selected. Eviivo did not mention that we wouldn't be able to access something as fundamental as a Revenue Report or Occupancy Report without upgrading to the premium subscription rates. Eviivo does not understand their clientele; proactive customer service and guest recovery are important factors that differentiate small hotels from the large brands. Support isn't even available after business hours-- their business hours, not ours. Eviivo's website states that they have a guaranteed 24hr turnaround for their Support Query. Our guarantee has not been met several times over. Eviivo's indifference is inexcusable. We're sorry to hear of the difficulties you experienced with getting help when you migrated across to eviivo suite from Rezo. If you'd like to discuss this with us personally please do provide us with some contact details and we'll be in touch. Our overall experience was very frustrating, and expensive. We lost business and time. We spent many hours setting up their system, only to never be able to use it. We were clients of Rezovation, which was purchased by Eviivo Suite. We went through the process of migrating over to Eviivo, so we did go through the training process, downloading the new calendar, etc. The system appeared to be very much like Rezovation, which we found to be an excellent system. If they get their technical problems sorted out, then this might be a very good reservation system in the future. We were clients of Rezovation, which was purchased by Eviivo Suite. We went through the process of migrating over to Eviivo, so we did go through the training process, downloading the new calendar, etc. The system appeared to be very much like Rezovation, which we found to be an excellent system. If they get their technical problems sorted out, then this might be a very good reservation system in the future. However, our experience was that Eviivo was never able to migrate our data over due to issues with converting currencies to Canadian dollars. They initially kept telling us that it would be corrected very soon. Then they quit responding to our phone calls and emails. During the process the old Rezovation system that they'd left running in the interim also had problems and we often had to take it down off of our website completely. We feel that we definitely lost business during the periods that we didn't have an on line booking system. We called and emailed them numerous times to at least get a progress report and, for at least the last month, they didn't even respond to our calls or answer our emails. We definitely cannot recommend this product for any Canadian companies at this time (we don't know if it's functioning elsewhere). We are sorry to hear of the difficulties you experienced with getting help when you migrated across to eviivo suite from Rezo. If you could provide us with some contact details we would like to be able to get in touch to discuss this personally with you. Eviivo has cost our business time and money. I am now looking to replace eviivo with another booking engine. It's a shame that the customer service is so lacking because I really had hoped I would like their product. Especially after being on Webervations for 15 yrs which saw virtually no improvements to their calendar despite so many technical advancements in that timeframe which really makes my point...how could eviivo be so much worse than the antiquated and outdated Webervations? At least Weber worked reliably and never cost me reservations.Absolutely nothing. Booking engine is NOT working. Their customer service is NON EXISTENT. Phone calls go to voice mail, emails unanswered, support tickets unanswered, online chat spotty at best. Absolutely nothing. Booking engine is NOT working. Their customer service is NON EXISTENT. Phone calls go to voice mail, emails unanswered, support tickets unanswered, online chat spotty at best. This booking engine is unreliable at best. Since going "live" 2 weeks ago I have not received a reservation thru eviivo because it doesn't work. I have received calls from guests who were unable to complete their booking online which was exactly my experience after I conducted my own test to ensure their system was actually functioning. My test booking never went thru...just kept cycling back to the reservation page. I am 2 weeks into this and have not even received a phone call back from eviivo and the booking engine is still NOT working. The customer service is NON EXISTENT. No one answers the phone, their online chat support is not staffed and most often is unavailable, email and support tickets go unanswered. I have a small lodging property and pride myself on being responsive to the requests of my guests. I am dumbfounded by the total lack of regard eviivo has for their customers. Each day that goes by without the booking engine working properly is costing my business revenue and disservicing my guests. Here are more negatives: 1. The address field asks only for a zip code and not the guests full address. Why? 2. The Discover card and Amex logos do not appear as accepted forms of payment even if your business accepts them. 3. The confirmation letter generated is poorly worded, is largely not customizable and is confusing for a guest to understand. 4. The booking page uses language native to the UK but not the US. Ex: Forename and Surname vs First and Last name. We are sorry to hear of the difficulties you experienced with getting help when you migrated across to eviivo suite from Weber. The software has some good potential. It's overall interface is nice and it should in theory be able to connect with many ota's. There is practically no customer support in the USA. I realize they are quite busy migrating customers from rezovation to eviivo, but thats no excuse for completely ignoring your customers. we had a problem with our migration from Rezovation to Eviivo. A lot of our historic data from the last few months disappeared. I've left Voicemails and online queries for the last 10 days and no one ever returns my calls or respond to the queries. They have an online chat function which would be great for reaching customer support- but it's been unavailable during regular business hours for the last few weeks. I've had credit card payments that show as approved in their system, but their card processor, Cardpointe has no record of them and I've never been paid. One of our room categories has 1 king bed and a max occupancy of 2. I set it up in their system as a max occupancy of 2 but they are showing it in my online booking engine as a max occupancy of 4. They seem to not thing this is an important enough issue to warrant a return call. Overall, this has been a disaster. I was really excited to make the switch at first, but i never in my wildest dreams imagined that their guaranteed max turnaround time of 24 hours for support questions would turn into 10days of unreturned calls. If you are considering switching to eviivo, I would reconsider. Perhaps someday they'll get their act together, but that day does not appear to be today. eviivo prices start at £15+ VAT/month and range up to a maximum subscription of £129+ VAT/month for very large properties. An eviivo subscription depends on the size of the property. To receive accurate pricing information, contact eviivo directly. eviivo is available as a native mobile application on iOS and Android, affording users the flexibility to create & manage bookings on the move from any smartphone or tablet device. eviivo's policy management tools enable users to set rates, promotions and discounts simply and effectively. eviivo provides full Payment Card Industry (PCI) compliance, allowing users to store, view and manage payment cards securely. A color-coded diary helps users to manage and review all online bookings accurately and efficiently. eviivo includes a marketplace, granting users exclusive access to over 100 different discounts from leading UK high street stores like Sainsbury’s, M&S and Boots. Below are some frequently asked questions for eviivo. Q. What type of pricing plans does eviivo offer? Q. Who are the typical users of eviivo? Q. What languages does eviivo support? Q. Does eviivo support mobile devices? Q. Does eviivo offer an API? No, eviivo does not have an API available. Q. What other apps does eviivo integrate with? Q. What level of support does eviivo offer?